Kristiansand's GREEN CARNATION is a project band assembled by Tchort (Who would join EMPEROR and SATYRICON later on) , guitarist Christer C.H. Botteri and bassist X. Botteri of IN THE WOODS as well as personnel from DRAWN, CARPATHIAN FOREST along with TRISTANIA's Vibeke Stene. 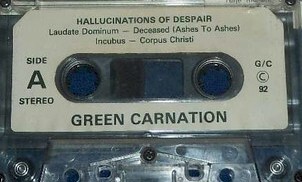 The band was actually a 1998 reformation of sorts, the original GREEN CARNATION having morphed into IN THE WOODS when Tchort took up arms with EMPEROR and singer Richart Olsen exited in 1992. 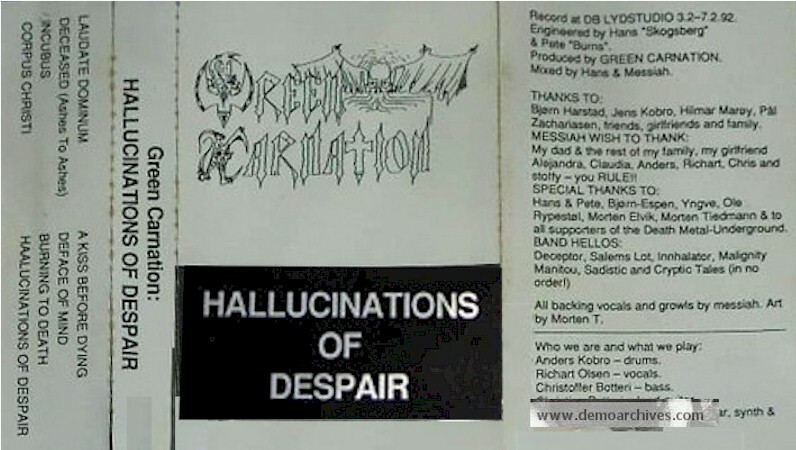 Operating in Death Metal territory the original variant of the band had issued just the one demo 'Hallucinations Of Despair'. The group, with Alf Tore Rasmussen newly installed on drums, was re-assembled in November 1998. Pro printed covers. Tapes were studio tapes with stickers on the shell.